CrossBar by Todd English: If you are old enough to remember when Limelight was a nightclub not a Marketplace, stepping into the latest offering from Todd English will bring waves of nostalgia. More gastro-pub than restaurant, CrossBar (www.crossbarny.com) is located in a series of rooms on two levels and the exterior courtyard of the church-turned-club-turned-mall (at 20th Street and Sixth Avenue) and has the feel of a Middle Ages-meets-Morocco lounge, with studded red upholstery and retro-chic chandeliers (shown above at left). The menu features a “head-to-tail” pork concept with snacks such as Puffed Pigs Ears and Pulled Pork Bites ($8), while entrees include Pork Schnitzel and BBQ Ribs & Tail. For non-pork-eaters, there are scallops, Loaded Gnocchi, and Lil’ Tacos of hamachi, chicken, or fried fish ($12-$29), among other offerings. Wash it all down with an eclectic mix of wines, scotches, bourbons, and beers. Just be wary if you order Delirium Tremens ($8), an aptly named and highly potent Belgian beer that tastes oh-so refreshing – before it makes you fall over. with a sweet treat called the Hummingbird Toffee Cake, and then head to The Terrace (shown at right) for an after-dinner drink. High Line Extension: It’s not a restaurant or bar (but it is surrounded by them), so don’t miss the newest section of the High Line (www.thehighline.org). 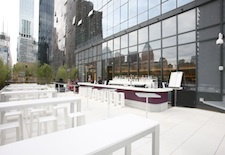 You can now stroll for more than a mile, from Gansevoort Street in the Meatpacking District to West 30th Street in far west Midtown, on this ambitious and meticulously landscaped urban park located on once derelict elevated railroad tracks built in the 1930s. Start your stroll at either end (there is elevator access at 14th Street and 30th Street), and meander amid modern pathways lined with benches and naturalistic gardens and witness architecture of Chelsea and the Meatpacking District from a totally different perspective. Open from 7am to 11pm daily; no dogs or bicycles allowed. Edi and the Wolf: When you’re exploring the East Village, wander over to 102 Avenue C at 7th Street and check out this nine-month-old, rustic-meets-shabby-chic restaurant (www.ediandthewolf.com) by chefs Eduard Frauneder and Wolfgang Ban, who also helm the upscale Austrian restaurant Seasonal (www.seasonalnyc.com). 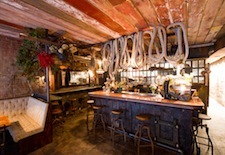 Their downtown take on Austrian fare (shown at left), served in a funky garage-turned-eatery with weathered plank ceilings, communal tables, and eccentric décor (peacock feathers and dried flowers abound) serves hearty traditional cuisine such as smoked mackerel ($14), spaztle with hen of the woods mushrooms, fava beans and asparagus ($17) and, of course, wiener schnitzel ($19), as well as a wide array of wines (there’s a small wine garden, too). The restaurant started serving brunch ($14, including coffee, orange juice, and bread) two months ago and standout items are the scrambled eggs with gruyere, walnuts and cipollini, and the schnitzel burger served on sliced challah with shredded cabbage and lemon aioli. 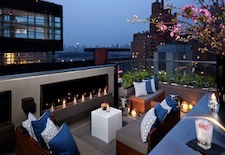 Above 6: If you find yourselves exiting Central Park or the Shops at Time Warner Center in the early evening and feel like sipping cocktails with a skyline view, head to Above 6, the brand new rooftop lounge (shown at right) atop 6 Columbus, a Thompson Hotel. This intimate space (it seats about two dozen people and has a retractable roof if the weather turns) serves sake, beer, and wine ($7 to $16), as well as assorted summer-inspired cocktails (try the very refreshing Hummingbird, made from Avinyo Cava, St. Germain, Club Soda, and Yama Momo, $13) created by the bar team at the hotel’s Blue Ribbon Sushi Bar & Grill on the main floor. 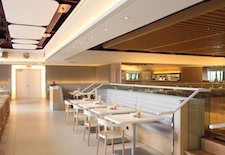 Seating is on a first-come basis, and access is via Blue Ribbon Sushi. 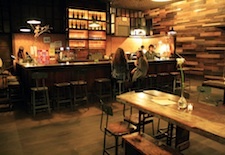 Brooklyn Winery: Williamsburg, a quick subway ride on the L train, makes a great half-day excursion from Manhattan. Get off at the first stop, Bedford Avenue, and wander the boutique and restaurant-lined streets (namely Bedford and N. 6th Street), and when you tire of window-shopping, head here to Brooklyn’s first winery (www.bkwinery.com), which opened in late 2010 at 213 N. 8th Street. It’s a cool spot (shown at left) to sip the winery’s newly available first offerings, which include Batch 001 Chardonnay and Brooklyn Noir (a pinot noir). There’s a happy hour every night form 5pm to 7pm, with 25 percent off every bottle of wine, or visit on $20 Bottle Wednesdays to get select bottles for just $20 when you order two food items from the menu.